So by now you all know I mostly read YA and middle grade books. I'm a teen librarian, it's my job. But every now and then I feel the urge to check out something more adult, though not necessarily "better." 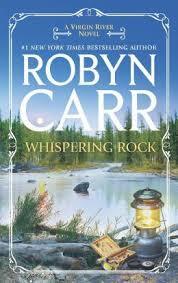 My latest discovery is the Virgin River series by Robyn Carr. I got a nice gift card for Christmas to B&N, and since I own a nook I like to use gift cards for e-books. I saw that the first four books in this series were on sale for $10 and took a chance on them. I'm really glad I did. 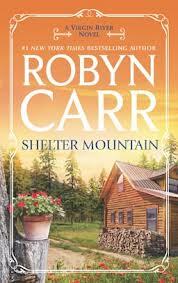 In Carr's books, Virgin River is a tiny town in Northern California way up in the mountains and woods. Like, I mean tiny--600 ish population. The first book tells Mel's story. She is a young widow whose husband was killed in a violent crime, and in an effort to get away from LA and the emergency room in the city, she decides to take a crack at country medicine. Unfortunately it's not really what she's expecting, mostly because the cabin she was promised is pretty much falling down ("It has a bird nest in the oven!"). But before she can leave, a baby is abandoned at the crotchety old doctor's house where she was originally supposed to be helping out (even though he clearly stated he didn't need her help). So Mel stays, at least for a while. And there the series begins. I flew through the first three books in this series. I really like the small-town atmosphere, which isn't always exactly neighborly as one might expect. And did I mention that each book is a romance? Yeah, this is a romance series, and it gets pretty hot sometimes to be honest. But it's more than that; it's about family, and what that can mean to different people. Each book sets up future story lines with subplots and perspective shifts (all told in third person), as well as continuing each previous couple's story through the next installments. No one's story really ends after their book ends, which makes me very invested in their lives since I've gotten to know them so well. It's true, during the third book I could really tell where the next book was going. Every time a single 20- or 30-something shows up on the scene, I know they'll get their own book at some point, and I know if someone is going to die or something. It gets pretty predictable. But I still really like it, especially because it's getting to be familiar. I'm not sure if it will continue this way for me, but I'll enjoy it while it does. Have you read the Virgin River series? What do you think of it? Do you have any series you read because they're comforting and familiar? My mom loves these books so much. She raves and raves and raves. When she finished them, she was actually depressed to lose all her friends. She has since started the series over. :) Glad you like them!